With OroCRM Tracking Websites functionality you can learn how many users have visited your Web-site from links within a specific marketing campaign and what these users’ actions at the site were. All you need to do, is to create a Tracking Website record and add the code generated to the web-pages that you want to monitor. Go to Marketing → Tracking Websites page and click Create Tracking Website button in the top right corner to get to the Create Tracking Website form. Owner* Limits the list of Users that can manage the tracking website record to the users, whose roles allow managing tracking-websites of the owner (e.g. the owner, members of the same business unit, system administrator, etc.). Additionally, you can connect the tracking record with a channel in the system. If this is done, you will be able to bind events registered by the tracking engine and other CRM data like orders, shopping carts, customer profiles, etc. This connection can be further utilized in reports and segments. Save the record in the system with the button in the top right corner of the page. The tracking process also depends on the Tracking settings defined for the OroCRM instance. General Information: general details specified for the tracking websites during creation and/or editing. Tracking Code: a piece of code to be added to the website in order to track the campaign-related user activities. The code and its usage are described in more details in How to Track Campaign Related Activities on the Website guide. Events: each event represents one time a user has accessed a pre-defined part of the Website following the campaign. Events grid contains name of the event, value of the event, user identification value, page url, campaign code and time the event was logged at. 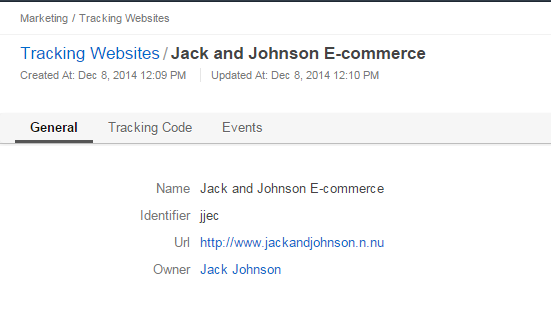 In the example above you can see the three kinds of events defined for the Jack and Johnson E-commerce website tracking. As soon as a user gets on any of the Website pages, a “visit” is logged. Value of a visit is always “1”. As soon as a user gets to the “Orders” page of the Website, an “Order” is logged. Value of an order is the ordered item id. As soon as a user gets to the “Item Details” page of the Website, an “View item” is logged. Value of a “View item” is the item id. 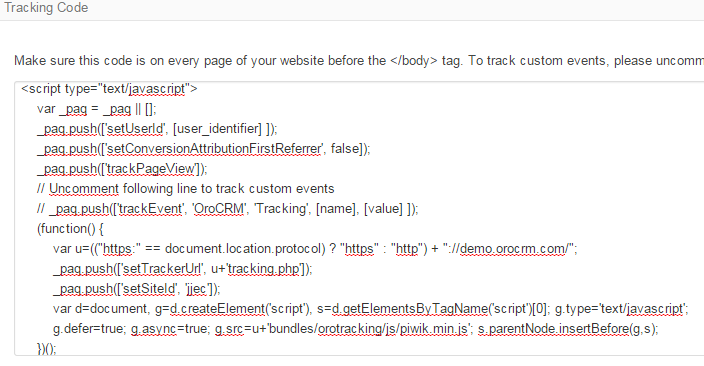 Tracking code that shall be added before the </body> tag on every page of the website can be found on the View page of the corresponding Tracking Website record. [user_identifier] defines the user id used in compliance with the Website settings. If you want to allocate user activities on a specific page of the Website, uncomment this line and replace the “[name]” and “[value]”. [name] is used in the system to refer to events on the page. [value] is any numeric value (e.g. for a cart, it can be an item code or cost). The code may be filled with both static and dynamic values, however the use of dynamic values requires complex back-end development. Users are identified as guests until they sign in. As soon as a user signs in, their identification is a value of the “visitor-id” field. A special block has been implemented to enable transfer of the ID data to Oro. An “Order successfully placed” event is saved for the campaign with a dynamic value that corresponds to a total cost of the order. Add the piece of code from the View page of the campaign to the tracking script from the View page of the Website Tracking record after setUserId call. Each time a user reaches a page with such a code, an event will be logged within the campaign. Add the piece of code from the View page of the campaign to the page url and use this modified URL in the link used for the mailing, advert, etc. Each time a user reaches a page with such a url, an event will be logged within the campaign.